AIMExpo 2015 has come and gone, and if you didn't notice, you're not alone. AIMExpo is touted as "the show that changed the powersports industry," which begs a couple of questions: "Where?" and "Really?" To be fair, the three-year-old expo is geared towards industry and dealer folk, and not jaded motorcycle consumers like you and I. 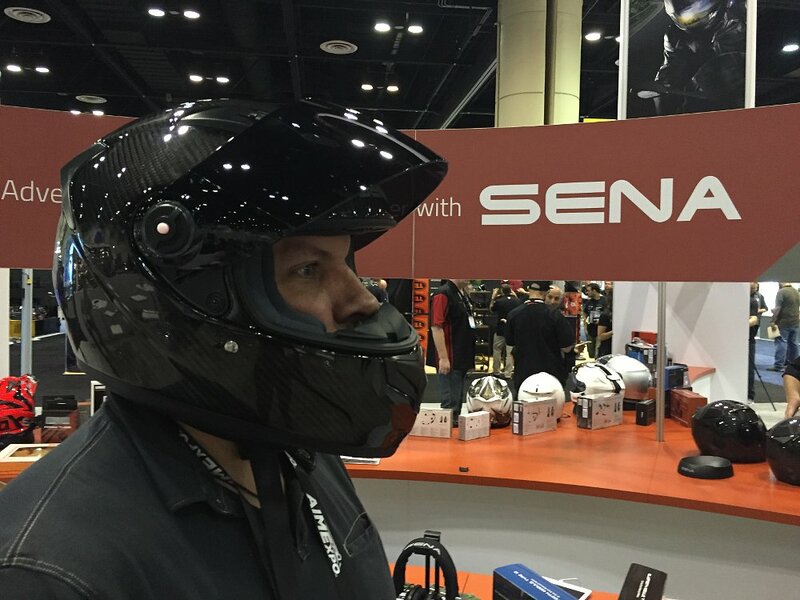 And this year's expo saw the unveiling of a few truly cool new products, particularly the new helmet offerings from Sena and Bell. But if I'm going to travel all the way to Orlando from southern California — as a civilian, or (ahem) as a writer on assignment — I'd like the trip to next year's AIMExpo to be worth my time and money (mine, or preferably Common Tread's). Though primarily aimed at people working in the industry, AIMExpo does cater to the consumer, with features such as demo rides. AIMExpo photo. Here's a few things I'd like to see to push expo to the next level. Yes, I know — this isn't EICMA or Intermot. But surely AIMExpo can do better than showing a couple of electric bikes that almost no one's going to buy (sorry, Zero), or trumpet the relaunch of Pagsta, a small manufacturer of 320 cc cruisers whose AIMExpo press release actually boasts of having Danny Bonaduce as a Pagsta rider. The most ogled bike this year was probably Yamaha's DT-07 dirt track concept bike, shown above, which nobody can even buy. Honda picked this year's AIMExpo as the place to unveil the 2016 CBR500R, and that's kind of a big deal. The middleweight sportbike looks great, and while I'd argue with the AIMExpo Blog's description of the bike as an "entry-level" machine, equipped with ABS it does look like a viable option for riders who want a bit more motorcycle than the 300 cc class offers to tackle their morning commutes. The growing market for American urban riders presents some great opportunities for brands to do what Honda did: use AIMExpo to show off bikes that might never be pictured on a magazine cover, but will appeal to a sizeable percentage of potential buyers. Rev'It was among the many manufacturers showing new gear at AIMExpo. Could we see more companies entering the motorcycle gear market? RevZilla photo. There's no shortage of gear manufacturers these days, as anyone who's ever spent some time on RevZilla proper can attest. Attention was given — rightly so, because the technology is worth showcasing — to Sena and Bell for their new, high-tech helmets. But these are outliers, and frankly the price points for both the noise-cancelling Sena Smart Helmet and the new Bell Pro and Race Star series will probably put those out of the reach of a big chunk of riders. What would be great — more American gearmakers using AIMExpo to unveil their latest ranges of jackets, pants, gloves and boots aimed at the average rider. Venerable bootmaker Bates officially launched its 2016 line of powersports boots at this year's Expo. This is the company's first foray into motorcycle boots, and they're making a bold promise to provide footwear that's as comfortable off of the bike as it is on it. The boots are also affordable, and look like they'd appeal to a broad range of street riders. The 2017 Harley Livewire. Victory's first sportbike. KTM's entry-level 390 ADV. Or maybe next year Skully shows up with a van full of their AR-1 helmets and lets expo guests take one for a spin? Wouldn't it be great if AIMExpo got a reputation for being the place where at least one completely unexpected production model was unveiled? Ultimately, what's missing from AIMExpo is that "wow" factor that the big overseas motorcycle shows have. I don't believe it's because the folks behind the AIMExpo aren’t aiming that high (sorry, bad pun), but just because it takes more than a few years to build to that level. I think the opportunities are there, and I hope we'll see a bit more of that next year in Orlando.